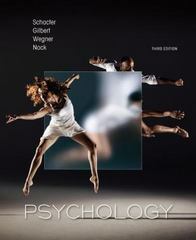 Psychology 3 Edition Students rarely look at a psychology textbook after leaving college, but they will continue to encounter psychology throughout their lives. With that in mind, renowned authors and researchers Schacter, Gilbert, Wegner, and now Matthew Nock introduce students to today's research with a focus on the critical thinking skills that will stay with them beyond the course term. Quirky examples of thinking gone awry, and scenarios based on common psychological misconceptions are just some of the tools the authors use to get students to question what they think they know about psychological science.